Modern dining and heavy metal music aren’t necessarily known for going hand in hand. Though there’s certainly no shortage of cooks who rock out to it in the kitchen, few restaurants have chosen to enhance their dining room experience by blasting Megadeth. But that’s not to say metal music and meals can’t be perfectly paired. For the past year or so, Chef John Hurkes has been contributing metal-inspired dishes to the food and music site Rice and Bread Magazine. His most recent contribution is The Black Sabbath Pizza made from “English banger sausage, smoked mozzarella, squid ink béchamel sauce, purple basil leaf, sweet lavender honey, and an authentic Mapledurham Watermill crust.” Suggested album pairings: “Black Sabbath and Master of Reality – The original thick riff classics banging from the deep ’70s. 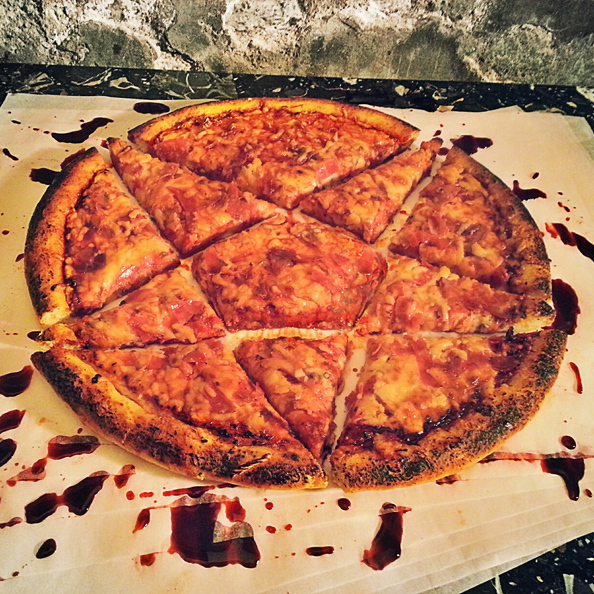 Chef Hurkes other recipes include a burger dedicated to Danzig, some killer Nuclear Assault nachos inspired by the ‘80s thrash metal band, and another pizza – this time sliced into a pentagram – intended to be paired with Slayer’s Reign in Blood. For now, there are about a dozen items in all covering a wide variety of metal bands, with each one providing ingredients, an album pairing and tasting notes. Alas, the write-ups don’t really include detailed cooking instructions, but you could try to go badger Chef Hurkes for his recipes in person. He is the Chef de Partie at Minneapolis’s The Bulldog Northeast. However, though The Bulldog looks like a perfectly awesome gastropub, it’s worth noting that their menu doesn’t get much more metal than a Tater Tot Hot Dish entrée.